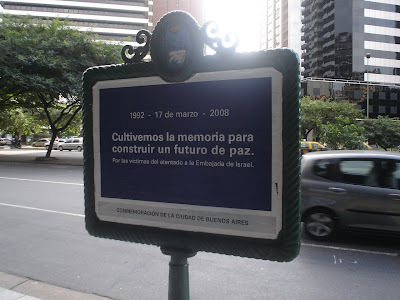 The terrorist attack to the Israeli Embassy in Buenos Aires took place on March 17th, 1992 at 2.42pm. At that time, a pick up Ford F-100 loaded with explosives smashed into the front of the building where the Embassy was. The pick up was driven by a suicidal bomber. The terrorist attack resulted with the death of 29 people and injured others 242. The terrorist group ‘Islamic Jihad’ appropriated the responsibility of the attack. Today, in the place where the Embassy was, there is a new memory square to commemorate the victims of the terrorist attack. In the Embassy of Israel Square we can find 27 trees representing each of the deaths left by the attack. As we can see, memory or collective memory is being promoted as the key to construct a new social consciousness. This is another example in which collective memory as a thing would be playing a central role at the time to facilitate the emergence of a new reflexive society whose aim is to restore justice through memory. As we notice, this framework is promoted not only by the relatives of the direct victims, (see Cromagnon case), but by a new official discourse held by the government at different levels (national, local, etc.). In the example of the Embassy of Israel, commemorative practices are being maintained by official frameworks of memory, in contrast to Cromagnon. However, collective memory is also being held as what has to be done by the society as a whole. The aftermath of a tragedy is focused on memory as a way to achieve a new social consciousness. Taking into account that collective memory is not a thing, but a process (that I would rather prefer to call ‘collective remembering’). Collective memory is not a mirror of the past, but multiple re-constructed mirrors according to different goals and positionings (government, the media, relatives of victims, political opposition, judicial system, etc.). So, I ask myself: is memory enough? I believe it is not.